At only 11 years of age, Harry Polden from South Woodford is already a professional West End actor. He has appeared in Priscilla Queen of the Desert, Oliver!, Joseph and the Amazing Technicolor Dreamcoat and is currently starring as young ‘Gustave’ in Andrew Lloyd Webber’s Phantom of the Opera sequel Love Never Dies (LND) at the Adelphi Theatre. When he sang a solo at a school Christmas show in 2007, his talent became apparent. 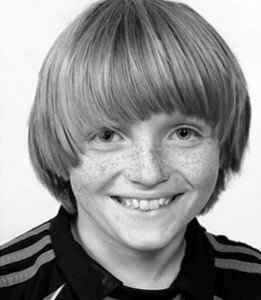 He joined Carmel Thomas Performing Arts School and successfully auditioned for a role in the hit musical ‘Oliver!’only a week later. Harry’s portrayal of ‘Gustave’ is very touching. He plays him as an innocent, shy yet adventurous little boy with a beautiful singing voice and has won his audience’s hearts. A great performance indeed! If you’d like to see Harry in LND, you’ll have to go soon. Harry will be leaving the show on 23rd July to enjoy some time off after over three years of almost non-stop performing and will be playing cricket, tennis or playing games on his Xbox instead – just like other boys his age. But doubtless, when the right role comes along, Harry will be returning to the stage as singing and acting is what he loves to do. When did you first realise that you wanted to be a singer/actor? That would be when I realised that it was something I was pretty good at – I got into Joseph and loved the audience appreciation! Ramin Karimloo. He has such a powerful voice and great acting skills as well. Apart from that he is really funny and kind – he’s always kidding around. He’s great. What do your friends think about you performing in the West End? Most of them think it’s really cool – a few have been to see me in the various shows. I love it when they come – especially my girlfriend Sophie! It makes it special when friends are watching. What’s your favourite subject at school? Science – we don’t do drama yet at my school. Experiments and all that are pretty cool. How do you manage to juggle school work, rehearsals and shows? I saw you in ‘Love Never Dies’ and really liked how you interpreted the role! How would you describe your character ‘Gustave’, what kind of boy is he? He’s quite a shy boy. He loves music and although he loves his father Raoul he feels like there’s something missing – he wants to discover new experiences. It is quite a big part. Do you ever get nervous? I was quite nervous on the first few shows back in August – but you quite quickly get used to it- you get the confidence to try new things, slight changes. I was nervous when I first sung for Lord Lloyd-Webber and Bill Kenwright! Luckily they liked me! What do you like best about playing Gustave? To be honest I like the curtain call! The audience reaction is amazing! Working with fantastic, talented performers, obviously- and singing “Beautiful” and “Beauty underneath”- what a brilliant song and dueting with Ramin and Tam is awesome! How many shows a week do you do? Four- then a week off. So Mon, Tues, Weds matinee & evening – then a week off and Thurs, Fri and Sat matinee and evening. And so on. What’s it like to be working with famous musical theatre actors/actresses such as Lee Mead, Ramin Karimloo or Celia Graham? Most of all it’s great fun! I’ve enjoyed every minute. Celia bought me a chocolate red rose at the end of my first week – I was performing with her when Sierra was on holiday. The adults I’ve worked with are inspirational – brilliant people but so down to Earth. Who would you most like to star alongside in a play or musical? They’d have to go some to beat Ramin Karimloo and Tam Mutu! Also Joseph Millson – he was such a brilliant actor! I know – how about Alfie Boe?! Wow, that would be unreal! You will soon finish playing Gustave (your last show is on July 23rd). What’s next? Some “me” time- a rest please! I’ve been performing for about 3 1/2 years straight and could do with a rest! I’m in a film called “Richard II” as a boy soprano, after that it’s wait and see. At 11, you are already a professional! You have appeared in four West End musicals so far: Priscilla Queen Of the Desert, Oliver! and Joseph & the Amazing Technicolor Dreamcoat. Which was your favourite role and why? Gustave by a million miles – it’s a principal part with a major role in the story and many great songs to sing. Although I did really enjoy playing Benji in Priscilla – that is such a funny show! What other musicals or plays would you really like to be in (now or when you’re older)? I’d love to play Gavroche but am probably a bit too tall now! When I’m older Phantom, definitely. In POTO and/or LND! Has anything funny or embarrassing happened to you on stage that you’d be happy to share with your fans? Tim who is understudy Raoul was cracking us all up saying funny things one time and I couldn’t stop laughing all the way through Pier 69 scene in LND – my mum and dad were on the front row and noticed! Do you still want to be working in musical theatre when you’re older? Yes, definitely but I know how competitive it is. You did an advert for the NSPCC a couple of years ago. Would you consider acting on TV if the right role came along? I’d love to work on TV- it’s very different – there was a lot of waiting around when I did the advert – but I loved the end result. I was called “Brian” – something my brother George found hilarious! You have two sisters and a brother – are they interested in acting too? Well my older sister acts at a youth drama group and my younger sister has been in shows with her performing arts school, including the Royal Variety Performance. George was in Joseph – he loved that but isn’t so fussed anymore. Who is your favourite actor/actress? On TV or films I would say probably Robert Downey Junior – I love the Iron Man films! Joseph Millson was brilliant in “Rocket to the Moon” and “Sarah Jane adventures” on TV. On the stage Ramin definitely. What do you like to do on a day off? I like to play Xbox! My hobbies are cricket, swimming and tennis. You like reading. What’s your favourite book? I love the Alex Ryder series. What music do you listen to on your IPod? Some rock like Guns n Roses and Muse. Also pop like Adele and Tinie Tempah. You play tennis. Do you watch Wimbledon at all, and if so, who do you root for? I root for Nadal. He’s simply the best! Two cats – Nancy and Benji. My brother has a snake called Slash! Gammon roast with roast potatoes, peas, carrots and a Yorkshire pudding. Plus gravy. Thanks to everyone who’s supported me and seen me on the stage – I hope you liked the shows – I’ve loved them! Cheers. Thank you very much Harry and all the best for your future, on stage and off!